As wonderful warm as it is cold, and easily made ahead, sesame noodle salad is the perfect answer to the what’s-for-lunch problem. 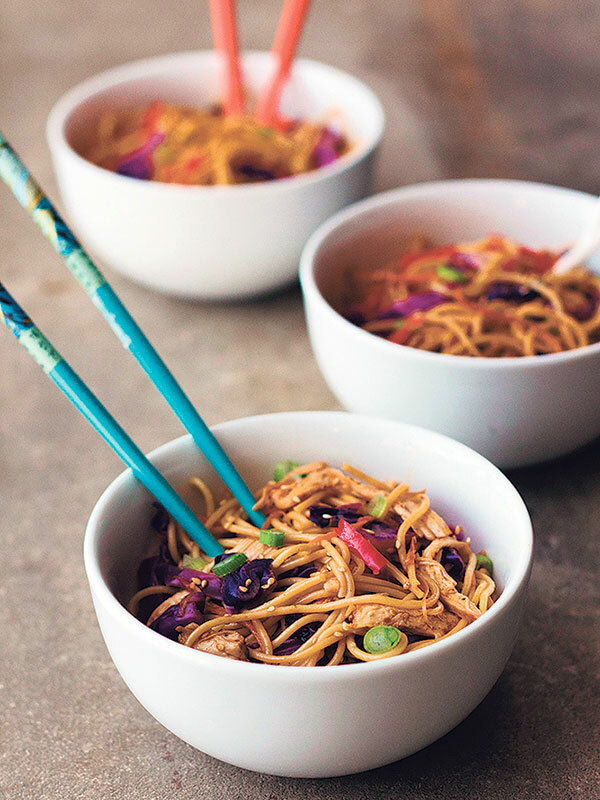 In this salad, noodles tangle together under a sweet, nutty sauce and combine with shredded grilled chicken for protein and heft. A mix of colorful vegetables add bright flavor and crunch, and the result is a summery, refreshing dish that’ll have everyone wanting seconds. Note: You can substitute soba or udon noodles for the spaghetti and/or use one pound of drained, dried, and crispy-fried extra firm tofu in place of the chicken. For the chicken: In a medium bowl, whisk together the wet ingredients and garlic. Season with salt and pepper to taste. Reserve one-quarter cup of marinade. In a gallon-sized bag, marinate chicken for one hour; drain. Preheat grill or grill pan to medium high. Add chicken to grill and cook, flipping once and basting with reserved marinade until cooked through, about five to six minutes on each side. Set chicken aside until cool enough to handle. Shred into small pieces and set aside. Prepare the vegetables. Heat the oil in the pan and toss in the carrot, cabbage, and pepper. Cook for six minutes, stirring constantly, until the vegetables are soft and tender yet still crunchy. Remove from heat. For the dressing: Combine all the ingredients in a small saucepan and bring to a low boil. Lower to medium and simmer for four to five minutes until well combined and slightly thickened. 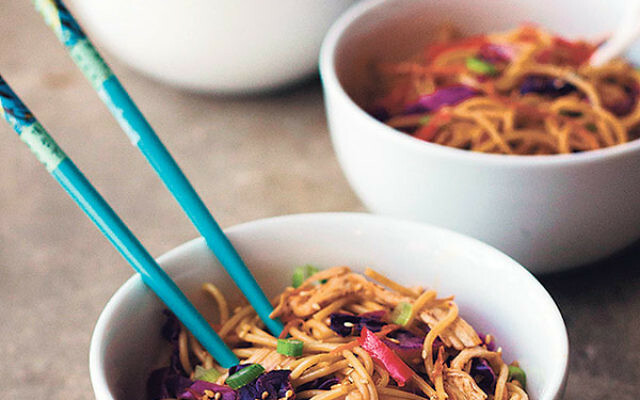 In a large bowl or pot, combine noodles, chicken, vegetables, and sauce. Toss with one of the sliced scallions and half of the sesame seeds until well combined. Serve warm or cold, topped with another sprinkling of sesame seeds and scallions.